Building a waterbed frame is not a hard or complicated process. With the right tools and a basic knowledge of woodworking, just about anyone can easily build this type of bed frame. Super Single (full): 48" x 84"
If you purchase a waterbed frame, it may need to be assembled. However, all the wood and hardware should be included. 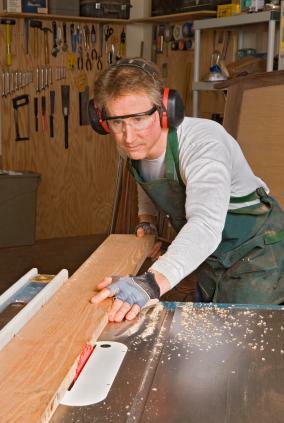 If you are building a waterbed frame from scratch, you will need to buy your own lumber. You can have the wood cut at the lumberyard where you buy it. The dimensions of the wood will vary according to the size of the bed you are making. If you decide to make a waterbed from scratch, you should buy your waterbed mattress first. This is because the size of a waterbed frame will need to accommodate the dimensions of the mattress, or water bag. Depending on the thickness of the water bag, the frame should be half of an inch deeper. The lumber that makes up the two sides of the waterbed will need to be at least two inches longer than the mattress on each end. Keep in mind that the following sample materials list is intended for a queen size frame. The dimensions of the lumber you buy might be different. Prior to assembling the frame, you will need to decide how you want the wood surface finished. If you have purchased natural wood to make the bed, you may want to stain all of the pieces before you assemble the frame. Next, figure out which edges of the sheet board will be the outer edges. Drill screw holes 1-1/2 inches from the edges, keeping them 7-1/2 inches apart. The countersink bit can be used to create a pocket in each drill hole so that you can drive the screws in until they are flush with the surface of the board. You will use the four timber planks to create the rectangular frame. The wood dowels will be used for this purpose. Take the six-inch doweling pieces and create a shallow groove down the length of each side. Then mark a line 1-1/2 inches from the end of each one of the sides. Cross each line two inches and four inches from the base face. You will clamp the end and side pieces together by lining up the ends in an L-shape. Use the C clamp to hold the ends together. Now you will drill holes through the side piece and into the end piece. Use a 1/4-inch drill bit to drill holes from each of the marks that cross the 1-1/2 inch lines. Drill the holes six inches deep on all four corners. Be sure to mark the ends so that you can put them together after you've drilled all the holes. Once you are done drilling holes you can lay the frame out, making sure to match the drilled pieces properly. To install the doweling, coat each piece with wood glue and then tap it into the drilled holes, making sure it passes through the end piece and into the side piece. Wipe away any excess glue. Repeat this step for each hole in every corner of the frame. Next you will fit the baseboard to the frame. 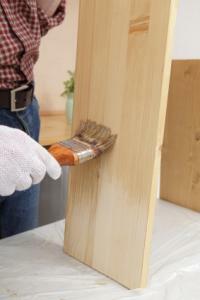 Apply wood glue along the centerline of each side and each end of the frame. Lay the baseboard on the frame, taking care to line up the edges exactly and clamp it into place. Screw the baseboard to the frame using the pre-drilled holes. Make sure the screw heads are flush with the board. Turn the entire frame over and wipe away any excess wood glue you find. Once the wood glue dries completely, your waterbed frame is finished. Waterbeds may not be as common as they once were, but you can still find all the parts and accessories needed to build and maintain this type of bed. Never mind the old rumors of waterbeds not being safe for second floor bedrooms. Any building that is up to code can easily handle the weight of a waterbed, which is less per square foot than a refrigerator, washing machine or bookcase. You can feel safe building a waterbed frame of any size on any level of your home.